Asencio’s mastery of the female form and ability to use color and abstraction to express emotion are testament to his refined artistic talent. His work entitled “Azure” is a perfect illustration of this communion of color and form. Surrounded by the empty lightness of the blank canvas, a beautiful woman emerges from the abstract wreckage. 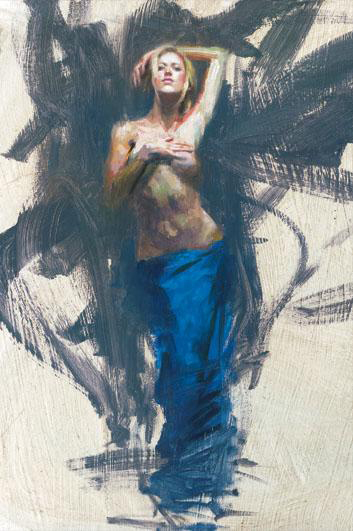 Loosely draped in a richly colored azure cloth, she stands confident, yet modestly covered as if ready to bare her soul. The artist’s use of minimal color in this electrifying composition serves to make a more profound statement. Mesmerized, our eyes are immediately drawn to her statuesque pose. She epitomizes sensuality, forever preserved as if immune from the ravages of time. Through the artist’s choice of posture and expression, we are also able to sense the underlying strength of her spirit.